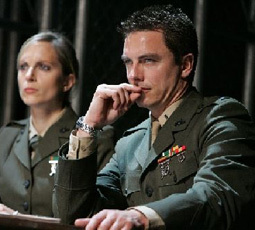 In late 2005, John was doing triple duty, appearing in Aaron Sorkin's miltary courtroom drama, A Few Good Men, opposite Rob Lowe and Suranne Jones and, during the day, training for the ice dancing competition show, Dancing on Ice for ITV. On top of this, he was also rehearsing for his pantomine debut in the First Family/Clear Channel production of Cinderella. John had to leave A Few Good Men one week early to start the panto run, exchanging Jack Ross's uniform for Prince Charming's crown.